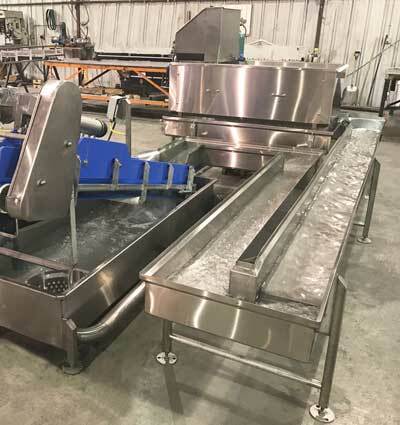 Open Flume System - TS Designs Inc.
29″ Tall Infeed Height so Cutters such as Urschel, cut directly into this Flume without Infeed Conveyors or Cutter Decks. 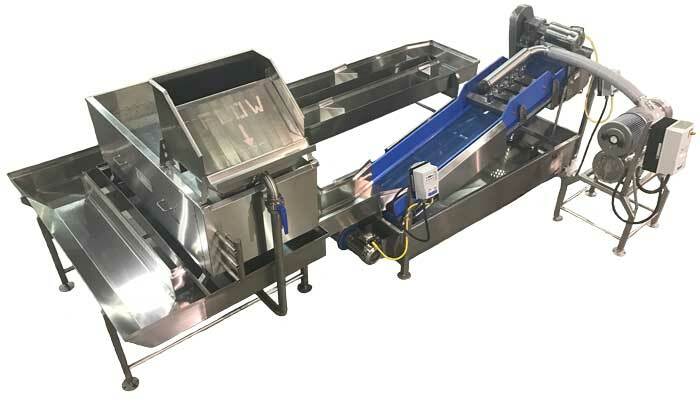 The Open Flume System is specially designed as an integral part of the cut, wash and dry line. The system has a triple purpose. 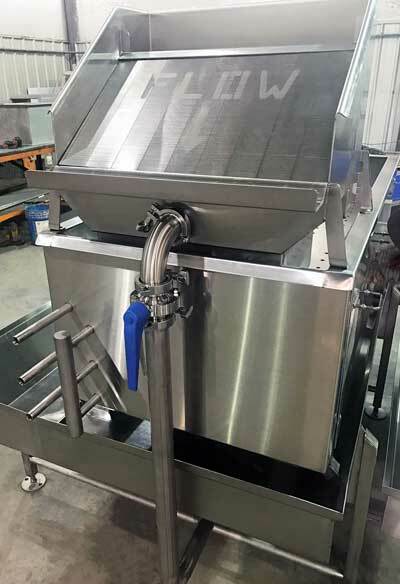 To remove large particles from the water using a filtering screen. To provide constant water circulation. Flume lengths and width vary due to plant layouts and product specifications, as well as product volumes. 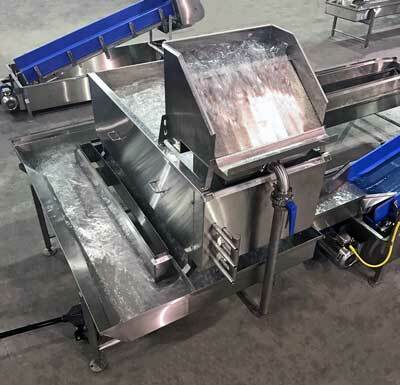 Flumes are designed with special water roll corners to allow for maximum product washing. 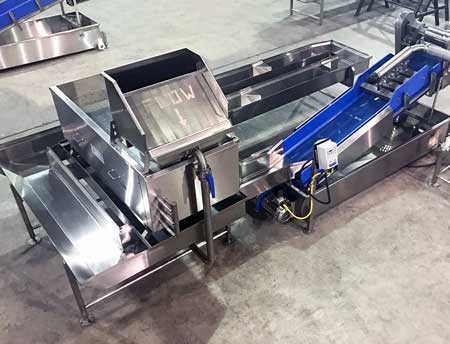 The Dewatering Tank and Conveyor allow for low profile design to eliminate raised cutter platforms and enable standard cutters to cut directly into the Flume. This combined package is the most compact system on the market today. This Filtering System is the most cost-effective and efficient filter. The water passes over a filter screen where particles larger than 1/32″ are removed from the process water. The designed rain system increases water to coil contact, providing optimal heat transfer and effectiveness. The clean open design allows for easy cleaning. 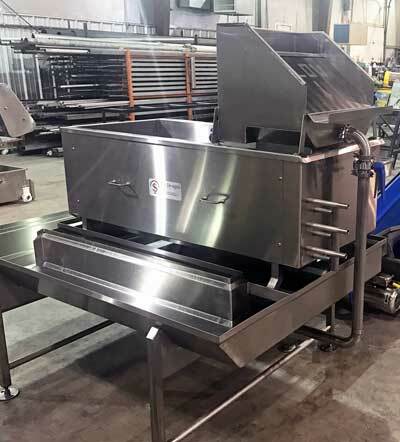 Explore information on the other food processing equipment sold through the firm by visiting the Products page. If you have any questions about grader shakers or other machinery, do not hesitate to Contact us online or at (208) 878-3000. We’re always happy to help clients pick out the right equipment for their operations.